Have you ever participated in a wine tasting session? Have you ever done a cheese tasting class? If you are a foodie, I bet you have done both, either one or have heard of them and want to in the future! Now if I ask you if you have ever gone on an olive oil tasting spree, most of you will look surpirsed! Olive oil? Really? Why would one want to do an olive oil tasting session? My answer would be pretty much the same reasons why you would want to do a wine or cheese tasting course. To get to know more about olive oil and the regions it is produced in and how the soil and the climate affects the taste of the oil. If you are anything like me, by now you must be hooked. 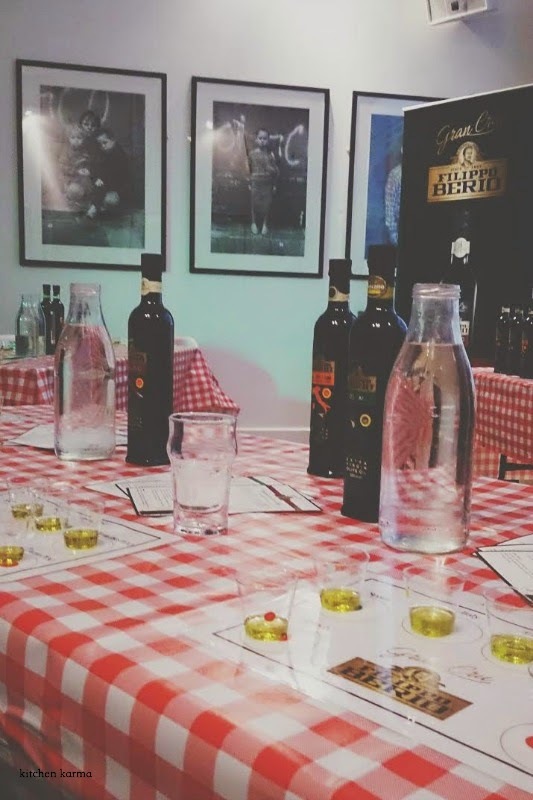 When I got the invite to olive oil tasting event by Filippo Berio, I was really curious. And I was not disappointed. I started from being a novice, who only knew how to cook with olive oil to distinguishing between the various olive oils from the different corners of Italy. For most of us living in the UK, Filippo Berio is a known brand. 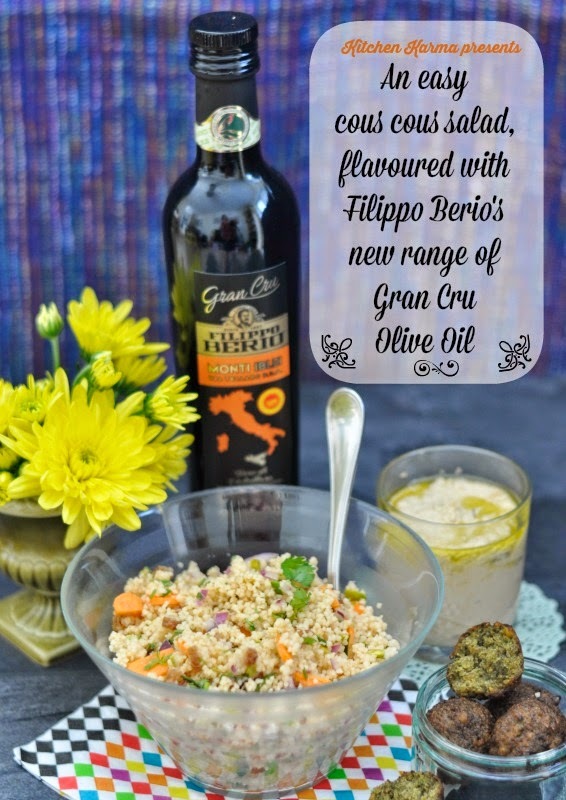 All those olive oil bottles lining the shelves of super markets usually belong to Filippo Berio. 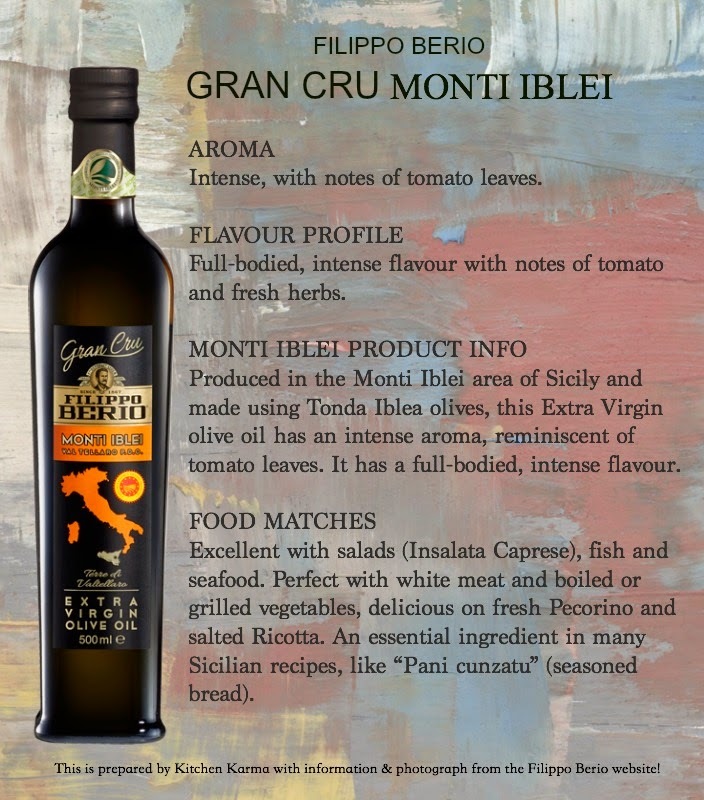 Recently they have launched a premium series of olive oil called the Gran Cru. 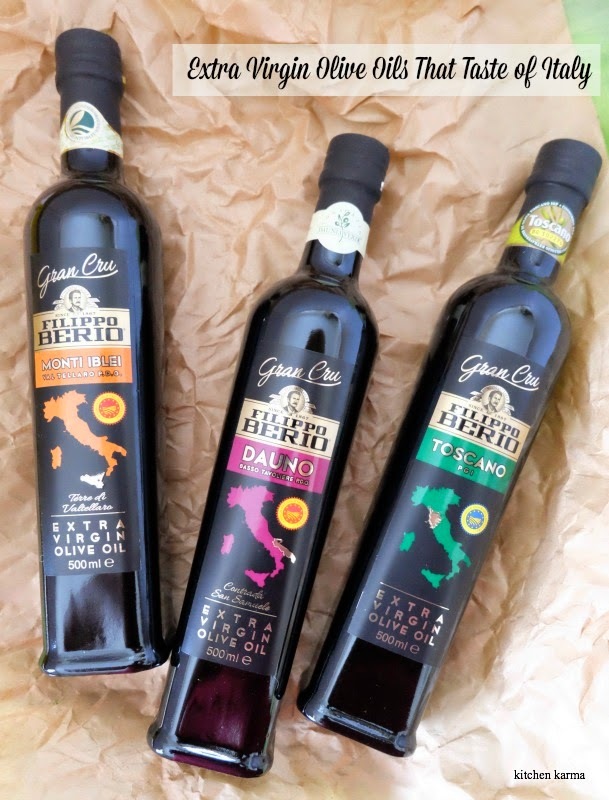 These extra virgin olive oil are from three different parts of Italy--Tuscany, Sicily and Puglia. 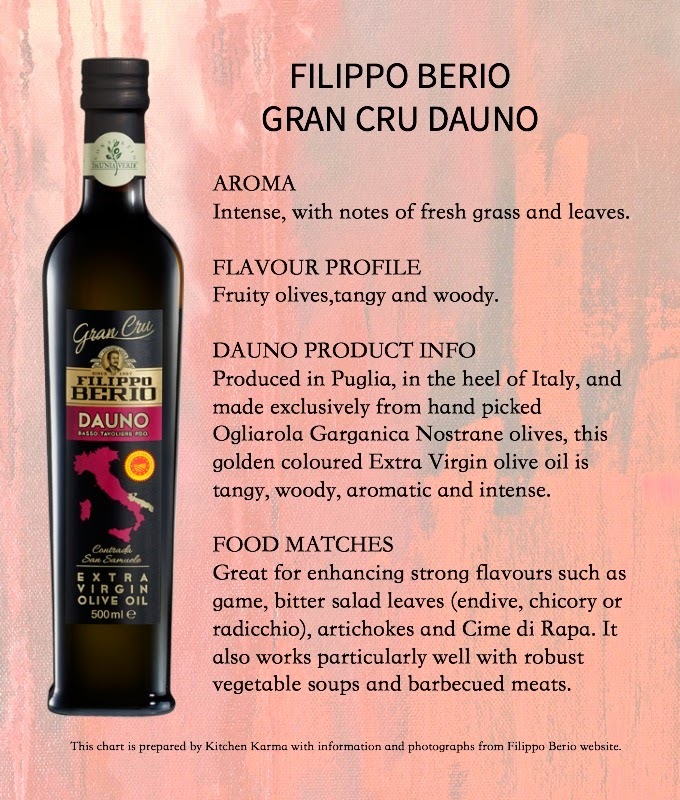 Each olive oil has a distinctive flavour and aroma and just like wine, each goes with a specific list of foods. 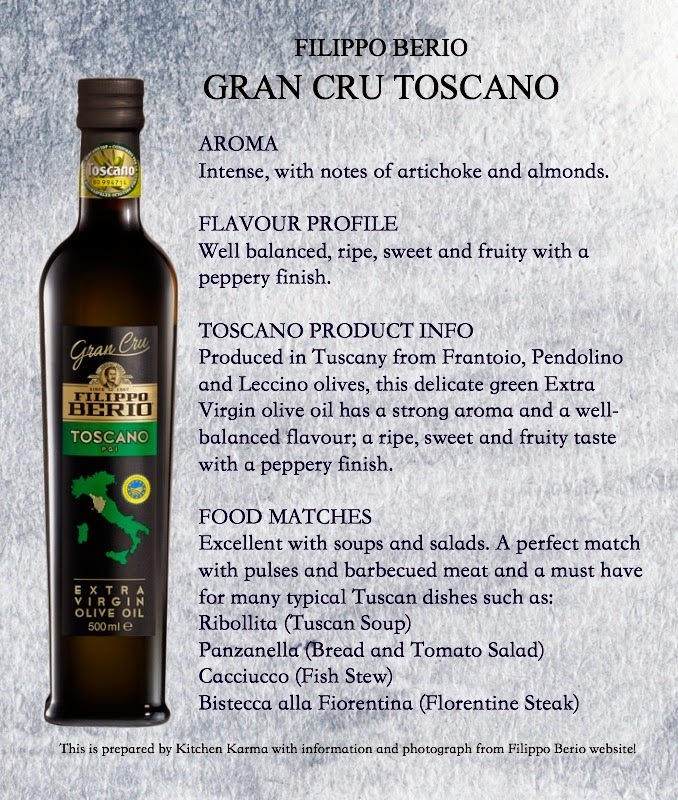 Some details about each olive oil below. The bottles as you can see are very smart and black. Not only black looks smart, the dark glass helps in preserving the oil and stops it from going off. These bottles are priced at £10 each and could be found in all the major food retailers in the UK. Ever since I have come back from the olive oil tasting session armed with a bag of olive oils, I have been using these oils in salads and soups. 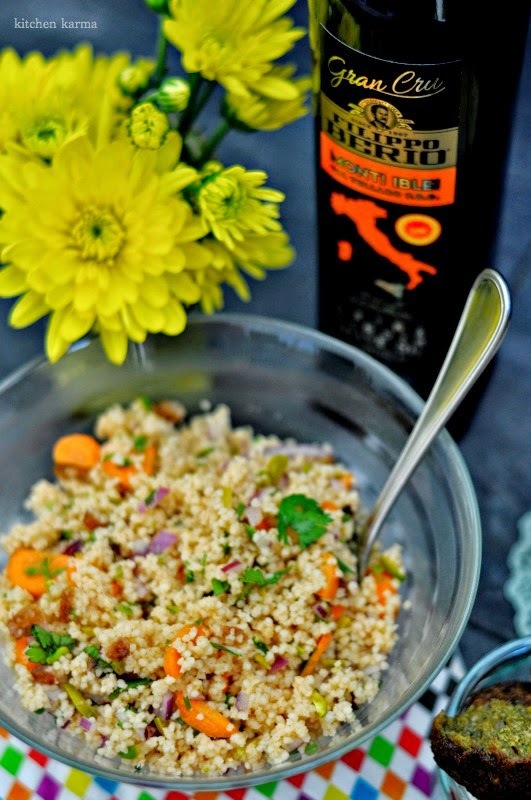 Sharing with you today a favourite salad of mine--a cous cous salad. This salad is extremely easy to make and goes well with a Mediterranean spread of olives, humus, falafel or Moroccan chicken/lamb dishes or even on it's own. Packed with flavour, this salad is a healthy option when you are craving starch. I make this salad a lot during summer, cos it is super quick to make and tastes great when served chilled. It goes a treat with grilled fish or meat. So it's a perfect accompaniment for BBQs. This is a very inclusive recipe, you can add/omit pretty much whatever you like. 1. Soak the cous cous in hot water, cover the pan and leave for 10 minutes. After 10 mins, take off the lid and using a fork, gently fluff the cous cous. By now the cous cous must have soaked in all the moisture and increased in size. 2. Add all the chopped vegetables. Mix well. 3. Add the flavourings and gently mix everything together. 4. Chill in the refrigerator for 2 hours or more before serving. Cook's Tip: I generally do not add the olive oil with the rest of the flavourings. I add it just before serving the salad. This retains the aroma of the olive oil.